Over 20.000 runners participate in Alexander the Great International Marathon every year! This program applies to F.I.T.s. Born in Marathon of Greece in 490 B.C. by the heroic effort of the soldier Phedippides who ran this distance to announce to the Athenians the victory of the Greeks, falling dead due to the overexertion. 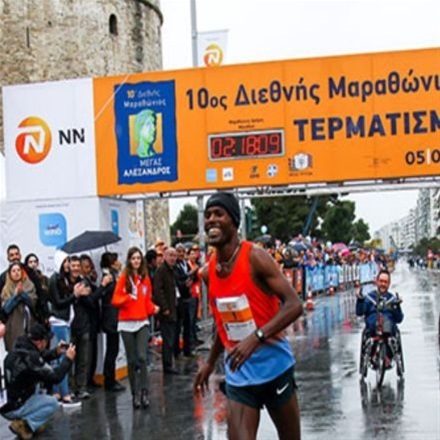 The Marathon race starts at the statue of Alexander The Great in Pella, the birthplace of the Great Commander and capital of the Ancient Macedonia and finishes in Thessaloniki, its modern capital, at the White Tower. The route of the International Marathon “ALEXANDER THE GREAT” is of low difficulty. Its main characteristics are the low altitude fluctuations, the continuous east direction and the long straight road. The International Marathon “ALEXANDER THE GREAT”, is not only a major and international sporting event of social, environmental and tourist importance, but also a path in history, a path full of Greece, from the ancient Greek culture until nowadays. TRAVEL AGENCY quality policy is the milestone for the achievment of the company's targets. This policy is based on the application of the Quality Assurance System and may be dynamically amended depending on the company's needs.